Senior Counsel Jim Mason is a member of HSLDA’s litigation team. He and his wife homeschool. In 2006, homeschool parents John and Tiffany Loudermilk faced a decision. They could let government officials into their home or immediately lose custody of their children. That dilemma led to a climax last week when HSLDA filed a petition with the U.S. Supreme Court, asking it to rule that social workers cannot threaten to remove children to gain entry into a home. An anonymous tipster put the Loudermilks on the Arizona Social Services’ radar. Two months after receiving the tip, two social services investigators and six sheriff’s deputies swarmed the Loudermilks’ property, demanding entry into their home. The Loudermilks exercised their constitutional right to refuse entry. But the investigators threatened to take the Loudermilks’ children into state custody unless they were allowed immediate entry. While the Loudermilks conferred with their legal counsel, the social workers started filling out the paperwork for temporary custody of the children. Under duress, the Loudermilks let the social workers into their home. Five minutes later the investigators left, stating that the tipster’s allegations were obviously false. The investigators did not just leave with their job done. They left a family whose Fourth Amendment right had been violated as a result of the investigators’ search. The Fourth Amendment of the United States Constitution guarantees the right of Americans to refuse unwarranted searches and seizures. A government official does not have a right to enter a private home unless the official has a warrant or faces an emergency situation. Because of the social workers’ violation of the Loudermilks’ Fourth Amendment right that morning, HSLDA sued the social workers. We are now appealing that case to the U.S. Supreme Court. You can read about the history of the case here. The Loudermilk case is key because the Supreme Court has never ruled that state social services employees cannot use a threat to remove children to coerce entry. That is the ruling we are asking the court to make in this appeal. You can read the petition here. A ruling from the Court would not only bring justice to the Loudermilks, but protect families across the nation from similar situations. Once HSLDA takes on a case, we are committed to see it through, even to the highest court in the nation. But just because we have asked the Supreme Court to review the case does not mean that the court will accept it, much less rule in our favor. We ask you for your prayers that the Supreme Court decides to review the case and bring justice to the Loudermilks. 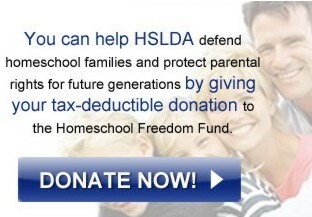 You may consider supporting HSLDA in our work on behalf of the Loudermilks and all families who will benefit from a positive ruling by donating to our tax-deductible Freedom Fund.